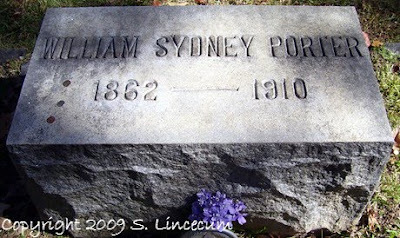 William Sydney Porter (1862-1910), son of Dr. Algernon Sidney Porter and Mary Jane Virginia Swaim, was laid to rest upon his death at Riverside Cemetery in Asheville, North Carolina. 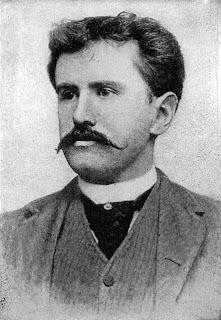 Better known as O. Henry, Porter was a well-known short story author. One of his most famous stories is "The Gift of the Magi." One dollar and eighty-seven cents. That was all. And sixty cents of it was in pennies. Pennies saved one and two at a time by bulldozing the grocer and the vegetable man and the butcher until one’s cheeks burned with the silent imputation of parsimony that such close dealing implied. Three times Della counted it. One dollar and eighty-seven cents. And the next Day would be Christmas. There are a few obituaries and funeral notices regarding Mr. Porter below. None of them, however, mention that he was convicted of embezzling funds from a bank in Texas. Before his trial was set to begin in 1896, William fled to the Honduras, where he wrote Cabbages and Kings and coined the term "banana republic." When he got word his first wife, Athol Estes, was dying, William returned to Texas and turned himself in. William's bail was posted so he could be with his dying wife. Athol died in 1897, and O. Henry spent 1898-1901 in the Ohio Penitentiary in Columbus. 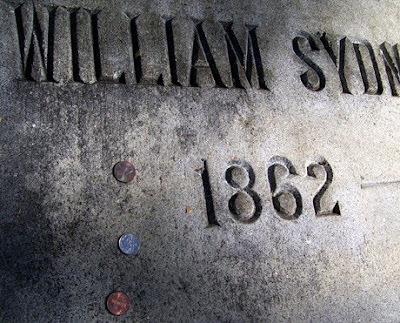 I tell you this because I noticed that when people visit William's grave, they sometimes leave him coins. A nod to his famous short story, most likely. But perhaps also a nod to his colorful history. William Sydney Porter, Well Known and Popular Magazine Writer, Succumbs in New York Hostpital -- Work Was Humorous, Attracting Much Attention. Literary Career Started On Staff of Houston Daily Post -- Formerly Cowboy, Sheep Herder, Druggist and a Traveler -- Little Known of Private Life. NEW YORK, June 5 -- William Sydney Porter, better known under his pen name of "O. Henry," writer of short stories, died today at Polytechnic hospital. He underwent an operation last Friday and never rallied. The nature of his ailment was not made known. Mrs. Porter, who had been in South Carolina, was not summoned by telegraph, but did not arrive here until after her husband's death. Mr. Porter was born in Texas 62 years ago, and began his journalistic career on the Houston Post. Before that he had been a cowboy, sheep herder and druggist, and an extensive traveler. The general public knew little of his private life, for he shunned interviewers and was content to be known merely through his writings as "O. Henry..."
...He had been in poor health for some time, but it was thought his illness was not serious. Wednesday he dined with friends and seemed in his usual spirits. Friday night he was taken ill and was moved to the hospital. A minor operation was performed, but up to within one hour of his death, it was thought he would recover. Derangement of both liver and kidneys, however, proved more deep seated than had been thought, and he sank rapidly. The burial will be at Asheville, North Carolina. SHORT STORY MASTER HAS WRITTEN "FINIS"
William Sydney Porter, Known as "O. Henry," Dies in New York. Native of North Carolina. Asheville, N.C., June 5 -- William Sydney Porter, who died in New York today, spent much of his time in this city. He was prominently connected with the Worth family in the eastern part of the State. As a young man he served as drug clerk in Greensboro, and when just past his majority went to Texas, where he engaged in ranching and commercial pursuits. He drifted to Houston and began his newspaper work on the Houston Post, and while there married. From Houston he went to New York and continued his newspaper work, and also began writing his short stories of the plains which immediately attracted attention. His first wife died after he went to New York. While writing under the nom de plume of O. Henry, his work attracted the attention of Miss Sarah Lindsay Coleman of this city, who herself was writing under the nom de plume of Sarah Lindsay. Inquiries made of her publishers revealed the fact that they were old friends, having had a youthful attachment while he was still a school boy in Greensboro. This old attachment resulted in their marriage in this city about two years ago. 'O. Henry' to Be Buried at Asheville. New York, June 7 -- Funeral services for William Sydney Porter, who under the name of "O. Henry" became known as one of the foremost short story writers in America, took place today in the Church of Transfiguration ("The Little Church Around the Corner") around which the author constructed several of his stories. Interesting post. I've passed the O. Henry museum/house many times in Austin, but never took the time to visit. You've piqued my curiosity to see what it holds. Love to see something posted on your blog about George Masa who is buired in Asheville's Riverside Cemetery - He charted almost all of the Appalachian Trail and was a great photographer of the NC mountains and helped to establish the Great Smokey Mountain National Park.